A mountain lion was sighted Friday night in the San Mateo hills, according to the San Mateo County Office of Emergency Services. The mountain lion was spotted near Tower Road and Paul Scannell Drive near San Mateo's Highlands area at 10:28 p.m., according to the Office of Emergency Services. The cat was reportedly heading into a wooded area and the California Department of Fish & Wildlife was notified of its presence. 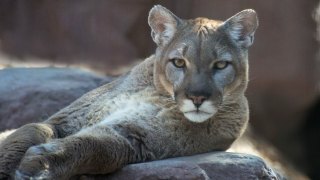 According to the citizen who reported the sighting, the mountain lion did not display aggressive behavior. The area was investigated but no mountain lion was found, according to San Mateo County Sheriff's Deputy Sal Zuno. "Mountain lion sightings are now so common in the areas that we patrol," Zuno said. "Especially because of the weather, more people are aware of their presence." The San Mateo County Sheriff's Office wants to remind the public not to approach mountain lions if they happen to see one, especially if it is feeding or with offspring. "If you see a mountain lion, do not engage with it," Zuno said. "Do not run away, stay very still and try to appear larger. Usually they will not approach people." Zuno is requesting the public to call the sheriff's office in order to report mountain lion sightings.